Facebook/Pelican Point KayakingNaude Dreyer of Pelican Point Kayaking saved a Benguela dolphin. A Facebook video showing the rescue of a beached dolphin has been viewed 4.7 million times in just over 24 hours. 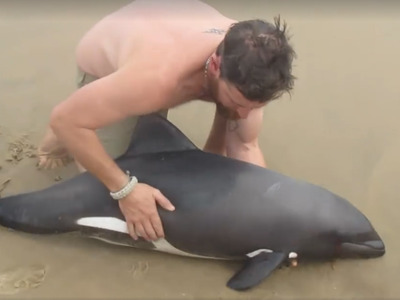 Kayaking guide Naude Dreyer, owner of Pelican Point Kayaking in Namibia’s Walvis Bay, happened upon the stranded young Benguela dolphin after giving a tour, according to the Facebook post.